Patagonia, a region located at the southern end of South America, is shared by Argentina and Chile. The scale-shattering terrain is famous for its mountains, rivers, wildlife, and vast open spaces. Here are some of the best outdoor adventures to experience Patagonia. Ride / ski at the world’s southernmost ski area: Cerro Castor, Ushuala, Argentina. This goes down as the southernmost ski center in the world. It’s season runs from about June to October, with some of the most epic conditions happening in September. It has a vertical rise of not quite 3000 ft. with slopes for beginners to world class experts. Nearby there are other centers that have dog sledding and cross country skiing, and the city of Ushuaia is a only about 15 miles away. Visit the Perito Moreno Glacier, Lago Argentino, Argentina. Ride horses along the Beagle Channel. Centro Hípico does horseback trips along the Beagle Channel. You can do a two hour, half day, full day or even a ten day adventure (which explores the isolated Peninsula Mitre). For the day trips, there’s no need to have any experience. Check out the penguin colonies in Ushuala, Argentina. HarbertonUshuaia, ArgentinaTaking an excursión to the port of Harberton to see the penguins is a must-do when in Ushuaia. There’s Magallanic penguins, Gentoos, and three (yes, three, King penguins). Only Piratour agency gets you trekking by them, the others get you close by boat. Taking an excursion to the port of Harberton to see Magallanic penguins, Gentoos, and three (yes, three, King penguins). Only Piratour agency gets you trekking by them, others, such as Canal Fun, get you close by boat. There’s a cute bed and breakfast nearby with a cafe with baked goods you should also check out, as it’s a couple of hours from any other town. And at Los Pingüinos Natural Monument, Punta Arenas, Chile. Take a dip in Lake Pehoé, Torres de Paine, Chile. Lake PehoéTorres de Paine, ChileWhile touring Patagonia make sure to stop by this lake and restaurant in Torres Del Paine. Bring a lunch and sit by the shores or refuel up on food and drinks at the restaurant while enjoying insane views of the lake and surrounding mountains. Camp out at Lago Roca, Argentina. This little-visited countryside forms the southern part of Los Glaciares National Park. During the weekends, Argentineans tended to show up with barbecues and radios, but otherwise we found the surroundings tranquilo. There are various trails, including a 3.5-hour hike to Cerro Cristal that starts right behind the camping libre. Campfires are permitted, but you have to bring your own firewood. Explore Tierra del Fuego National Park. Tierra del Fuego National ParkUshuaia, ArgentinaThis is only about 15 minutes outside of town and warrants a visit. It can get crowded, so try to go with a company that knows how to avoid the tour busses (I went with Tierra Turismo and they were able to avoid the crowds). Solid hiking trail info is tricky to come across. There are a couple of campsites you can crash at, but you need to be prepared and bring all your gear – there’s no refugios. Dress for insanely quick changes in weather – sun, snow, high winds, it’s all possible. Tierra del Fuego National Park can get crowded, so try to go with a company that knows how to avoid the tour busses. Solid hiking trail info is tricky to come across. There are a couple of campsites you can crash at, but you need to be prepared and bring all your gear – there’s no mountain refuges to help you out. Dress for insanely quick changes in weather – sun, snow, high winds, it’s all possible. Don’t leave before checking out the tiny post office. You can get your passport stamped with an ‘end of the world’ stamp and the old postmaster dude who runs the show there is a character. Hike to Laguna Torre, Argentina. There are two trails marked for Laguna Torre from near the center of El Chalten. They converge some 5-10 minutes from town, so it doesn’t matter where you start. The trail is well-marked and maintained throughout so there’s no need for a map. You’ll see Torre’s dramatic peak well before you reach the laguna. For much of the hike, the 3,128m (10,262 ft)-high spire will be your guide. Helicopter through the Andes and over the Beagle Channel. You can fly through the valleys and over glaciers in the Andes, checking out not only famous Laguna Esmeralda but many other more hidden turquoise lakes and lagoons. The nature photo opps don’t get much better than this. If you are going to splurge once on your trip, do it here. HeliUshuaia can also hook you up with heli-skiing trips and some crazy-exclusive fishing trips. 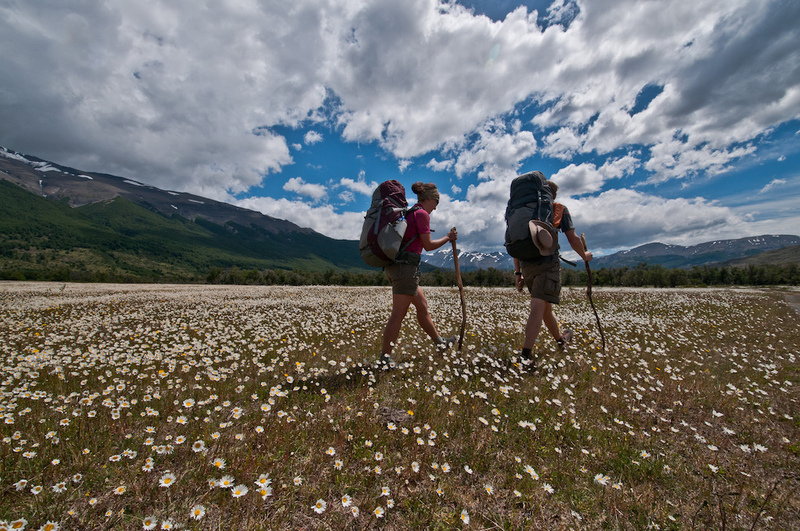 Tackle the longest trail in South America, the Greater Patagonian Trail. Near the village of Puerto Rio Tranquilo, a dirt track leads into the Valle Explorados. It’s a dead-end road that will take you to a splendid camping spot along the Carretera Austral. With views of hanging glaciers, you’ll camp next to humongous rhubarb called nalca, which locals eat raw with a bit of salt. No five-star hotel could beat the comfort of a roaring campfire after having bathed in glacial waters. Tierra Turismo offers 4×4 tours deep into the region’s best places, with a total respect for nature. If you can’t stand the idea of being cooped up in a truck all day, schedule one of their 4×4 / kayak trips. They know how to get you away from the crowds…and you’ll probably end up feeling like long lost friends with your guide at the end of the trip. Every guide here is top notch and super cool, but if you happen to end up with Ignacio, bust out some old Guns and Roses or Bon Jovi from your phone and watch the karaoke show go down. Hike Laguna de los Tres, Argentina. Cycle Ruta 40 through Patagonia. 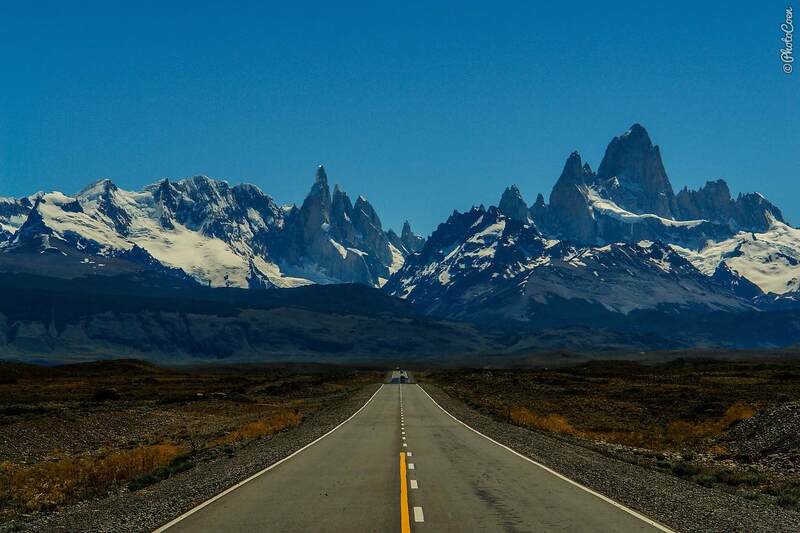 The deserted highway follows the Andes northward, zigzagging between the tiny towns that dot the Patagonian Steppe. Although a popular motorcycle route, venturing by bike allows the senses to absorb every sound, taste, and view that makes up this legendary region. Take on Cerro Fitz Roy, on border between Argentina and Chile, in winter. On the fringes of the hiking season in early and late winter, the ridges of Cerro Fitz Roy are covered with snow, making many trails inaccessible. Though challenging, the harsh conditions yield tourist-less hikes and magnificent views like this one taken during a lunch break. Climb the Towers in Torres de Paine, Chile. Drink microbrews at the end of the world. Garibaldi is for people who are more about sharing artisanal beer with chill people in a remote location – there’s nothing ‘ultra hip’ or pretentious about this place and that’s why it’s so damn charming. It’s in between Ushuaia and Rio Grande just outside of Tolhuin – definitely hit it up, especially if you do a lakes or fishing tour (you’ll already be in the neighborhood). When leaving through nearby Tolhuin, fuel up at the La Union bakery for the trippiest experience while not on drugs that the region offers.